Apple puree is in widespread use for producing babyfood, juices and juice drinks, for broad list of confectionary (marshmallow, pastille, frit jelly, jam and etc.). Apple puree is also used in production of confectionary fillings, sauces and ketchups. We have carved a niche amongst the most trusted names in this business, engaged in offering a comprehensive range of Apple Cider Juice. 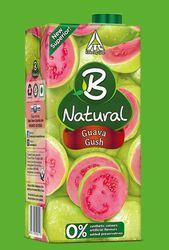 The B-Natural Apple Juice 100 Pureness offers an unmatched flavour of delicious, juicy apples. Prepared from whole fruits, this drink adds health to your diet. Apple Blast Ingredients : Apple Blast 250ml- Rs.49. We produce 100% natural apple juice from our plant in Kashmir. We do not add any preservative or sugar. We aquire juice from very good quality apples. You can order us in bulk for your requirement.